Should I reserve the RV campgrounds ahead of time? Are you planning an RV vacation in Canada, and you're wondering if you should reserve the campgrounds ahead of time? In just about any season, the answer is yes. If you are travelling between mid-June and the end of August, you are travelling in high season. If you want to be sure of availability, you should reserve at least 3 month is advance. It is not particularly enjoyable to have to spend precious vacation time searching for campgrounds. Opt for peace of mind. Another good reason to reserve early, even if you are not travelling during high season, is to have access to the best campsites. 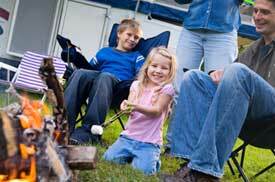 The principle of "first come, first served" also applies to campgrounds. Some travellers reserve up to 1 year in advance to be sure of getting the site of their choice. While it may be true that reserving ahead of time removes an element of spontaneity, it also removes a major source of stress and of time wasted during your vacation itself. Anyway, if you have done your homework and planned your itinerary properly, each stage of the trip will have been carefully selected and you will have no cause for improvisation.